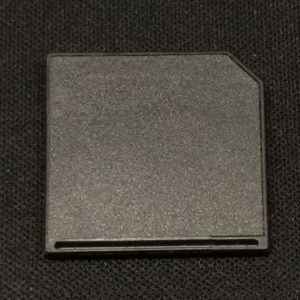 In case you bought the DivMMC EnJOY! 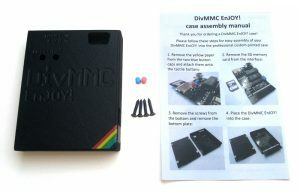 without case, and were thrilled by photos of the DivMMC EnJOY! Black Edition with case, you can order the case separately. This case is NOT for a DivMMC EnJOY! PRO ONE or any other PRO version such as the PRO MINI, PRO MINI *lite*. The case requires the DivMMC EnJOY! v2014.1 version or higher of the DivMMC EnJOY! with DIP switches and screw holes. The first small batch – the DivMMC EnJOY! 2013 version (with jumpers) – will not fit. The cases are professionally custom 3D printed. They have two light-guides that show led activity, two button caps for reset and nmi and a professionally printed rainbow sticker with information for the DIP switch configuration on the side. The screws at the bottom sink into the holes of the bottom plate, so no damage is caused on your desk. The case of the Black Edition is impregnated (dyed) so scratches will not show the white source-material, and is spray painted to make the cases 100% black. All necessary parts as described above are included with the delivery of the case, and an added easy assembly manual will help you complete your DivMMC EnJOY! in the blink of an eye.